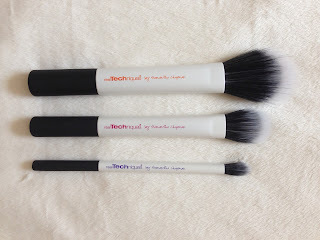 So I finally caved in and on a recent shopping trip I became the new mother to the latest release from Real Techniques, the Limited Edition Duo Fiber Brushes. On first impressions the brushes look very sleek, I like the white tips at the end and they generally just feel good to hold, easy to grip and a nice smooth texture. The brush set comes with three limited edition brushes a face brush, a contour brush and an eye brush. The brushes are made of synthetic fibers and are cruelty free. The claim is that they work well with cream, powder and liquid cosmetics. The bristles all seem quite dense at the base, fanning out and becoming lighter at the top, this enables them to provide the natural, airbrushed finish that they claim to give. A lot of the bad reviews of this product I have read seem to be due to the poor product placement but these brushes aren't supposed to deliver a harsh covering, they are supposed to create a platform for buildable coverage. I have to say I think this is my favourite brush in the set, this brush feels like it bounces off your face as you apply your powder or cream and it picks up just a small amount of product meaning you can build rather than end up with the dreaded clown face from using a brush with a more dense finish. 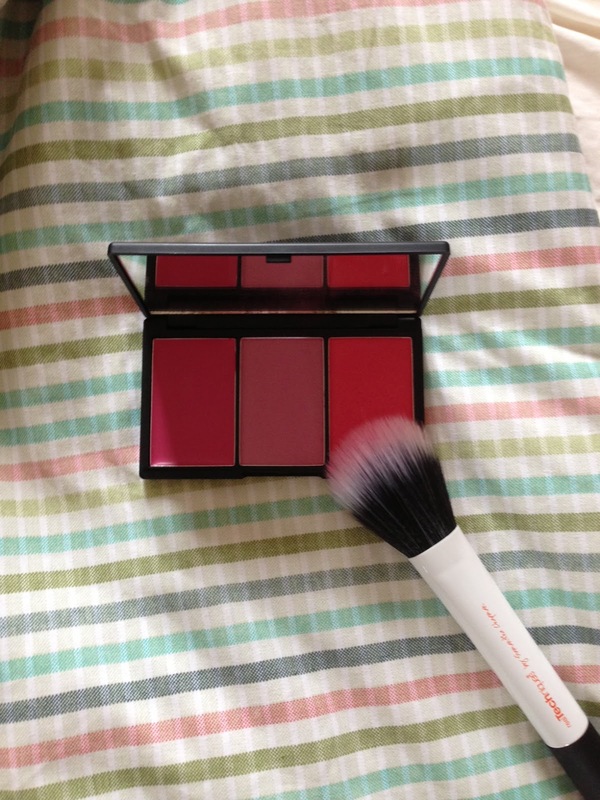 I like using this brush for an all over covering of either setting powder or bronzer and the light finish makes it perfect for summer or for adding a light covering of bronzer for those of us on the pale side. I also find this an excellent blush brush when using highly pigmented blushes such as Sleek or Illamasqua which can tend to come out very strong with one swish in the pan. I wasn't a fan of this with liquid, either foundation or liquid highlighter. I found that the sparse bristles weren't the best at blending vast amounts of liquid so I will stick to my normal brushes for this purpose. I have been using this brush to apply highlighter to my cheekbones and it gives a lovely sheer finish, again delivering on the promise of a natural, airbrushed finish. I think in winter it will be great for a subtle contour but as it is summer and I'm sporting a bit of a tan I have been using a denser brush to give a more prominent contour but again, pale ladies might find this brush right up their street. Another advantage of this brush is how well it can softly blend out already applied make up without leaving streaks. This is a great brush for blending colours into each other after you have been mixing crease and base colours, it also does very well at lightly highlighting the brow bone. Reviews I have read online have critisised this brush at being scratchy but I didn't find that to be true for me and I think this will become a staple that I reach for when applying my daily make up. All in all I think these brushes make a nice addition to anyone who enjoys their make up and I'm glad I picked them up to add to my ever growing collection. First apply Urban Decay Primer Potion to your entire eyelid and blend upwards with your fingers. Next, shade in your lid with NYX jumbo pencil to make a white base that will help your bright colours to really 'pop'. Next take a base shadow brush to start packing on your yellow colour, I used the Real Techniques base shadow brush for this. Apply Hype all over the lid, use a patting motion to get a bright build up of colour. Take a crease brush (I used Real Techniques Deluxe Crease Brush) to blend your orange colour into your crease. Use MAC 217 to softly blend upwards and out and fuse Hype into the orange. Next take a precise eyeliner brush (I used Real Techniques Pixel-Point eyeliner brush) and wet it, this way you can you your eyeshadow as an eyeliner. Take 'Victim' and using your wet brush to pick up colour, line your eyes close to the lashline from the middle to the outer corner. Repeat previous step from the middle to the inner corner. Following the natural line up from your bottom lashline, extend your blue line as high as you like it (see pic below) and then join with the upper lash-line from the middle and shade in the gap with more blue. Repeat till you get the intensity of blue that you want. Line lower lashline with same blue. Go along the top blue line with Illamasqua Precision Ink to get a nice white line like sea foam, add white dots from the same liner into your blue and if you want to, pull a few white dots upwards to look like sea splashes. Apply Mac Vanilla pigment to the inner corners of your eyes for definition. Finished! now you can either add some false eyelashes or apply a dramatic mascara. Welcome to Sparkles of Light, you can also catch me on instagram @sparklesoflight and see all my pictures on there too. 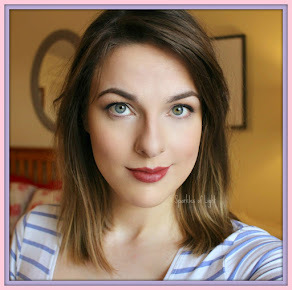 This blog is mainly going to be a beauty blog, hope you enjoy!